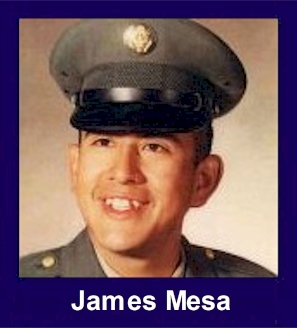 The 35th Infantry Regiment Association salutes our fallen brother, PFC James Gregory Mesa, who died in the service of his country on September 30th, 1968 in Quang Duc Province, Vietnam. The cause of death was listed as Small Arms/AW. At the time of his death James was 20 years of age. He was from Jamul, California. James is honored on the Vietnam Veterans Memorial at Panel 42W, Line 48. The decorations earned by PFC James Gregory Mesa include: the Combat Infantryman Badge, the Bronze Star, the Purple Heart, the National Defense Service Medal, the Vietnam Service Medal, the Vietnam Campaign Medal and the Vietnam Cross of Gallantry with Palm Unit Citation. I met Jim in boot camp and we went on to Infantry training together. We teased him about being to nice a guy for war. And we meant it. And then on to Vietnam where a quirk of fate seperated us at the replacement depot. He was truly one of the nicest guys I have ever known and it does not suprise me to read that he died trying to help someone else. I am placing a plaque to him on the Mt. Soledad Memorial in San Diego for those who would like to visit. I went to school with Jimmy......He was a great guy. He played a mean trumpet!!!! God Bless you Jimmy.